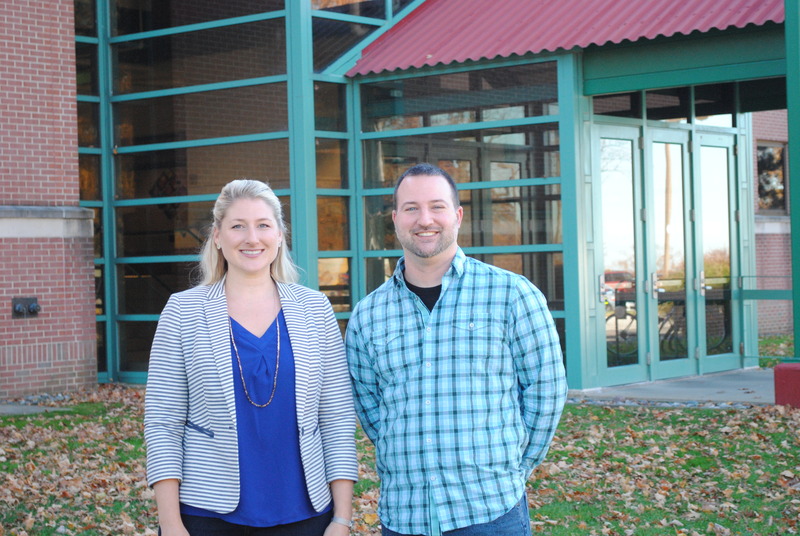 Behrend alumni Erika Dauber Berlin and Matthew Totzke are challenged with running a textbook company, Larson Texts, in the 21st century. In an age dominated by tablets and tweets, the prospect of running a textbook company might seem daunting. There’s nothing “textbook” about the operations of Larson Texts, however. Technology has changed the game, but the Erie-based company has continued to adapt. Larson Texts was founded more than 30 years ago by Ron Larson, then a professor of mathematics, now emeritus at Penn State Behrend. At the time, Larson was responding to what he saw as the need for more student-friendly math textbooks. Today, the company produces math textbooks for sixth grade through college-level calculus classes that are used by more than five million students each year. Larson has also published textbooks for such well-known educational publishers as Cengage Learning, Houghton Mifflin Harcourt, Pearson, and W. H. Freeman and also publishes its own textbooks through Big Ideas Learning and AndYou.com. Publishing a book, involves more than producing a physical textbook. With every college-level textbook that Larson Texts creates, the company also develops a fully-responsive companion website for all platforms: desktops, tablets and smartphones. “We’re able to access so much more information than ever before. Now, we can really blend a great print book with strong digital content,” Totzke says. That type of digital content featured on the companion sites includes worked-out proofs, instructional videos, rotatable graphs and downloadable data. All of these tools are great reference materials for students. Being ahead of the digital curve is no new development for Larson. In 2001, the company created the website CalcChat as a tool that students could use to double check answers to questions posed in textbook exercises. The site has since been supplemented by a tutor component and corresponding Twitter and Facebook accounts where students can talk with an actual tutor if they are struggling with a particular problem. Larson Texts monitors the tutor conversations as a way to gain feedback and develop solutions in areas in which students are continually struggling. According to Totzke, an estimated six million upper-level high school and college students have used the CalcChat service since 2010. Through Big Ideas Learning, Larson publishes its own primary-school level books, a market segment the company expects to see expand as schools catch up to colleges and universities in terms of technology. It may not be the “textbook” method for creating educational publications, but Totzke would not have it any other way. This entry was posted in Alumni stories, School of Humanities and Social Sciences, School of Science, Technology and tagged Behrend, Erika Dauber Berlin, Larson Texts, Matthew Totzke, Penn State Erie. Bookmark the permalink.